Make the most of the lighter Spring evenings and enjoy an Evening in France at The French Chef at Home’s pop up event being held at 10 Devonshire Place, Harrogate. On Wednesday 27 April at 7pm Yves will cook a magnificent six course French tasting menu, matched by a flight of wine pairings courtesy of Patrice from Le Bon Vin who will talk guests through them. Yves is classically trained under acclaimed chef Alain Ducasse. His cooking combines the traditional gourmet flavours of France with seasonal fresh Yorkshire produce. 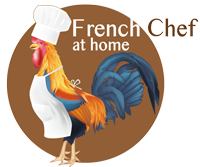 He set up French Chef at Home to create authentic and bespoke French cuisine at people’s homes for special occasions, corporate events or just a luxury night in. Yves also offers tutorials in your own home for between one and four people.